It’s National Potato Chip Day, in these United States. Any part of the urban landscape which the voracious minions of the Real Estate craze sees as “having a large footprint” is in danger of being consumed by it. Supermarkets, factories, warehouses, and in the case of today’s post – gas stations. 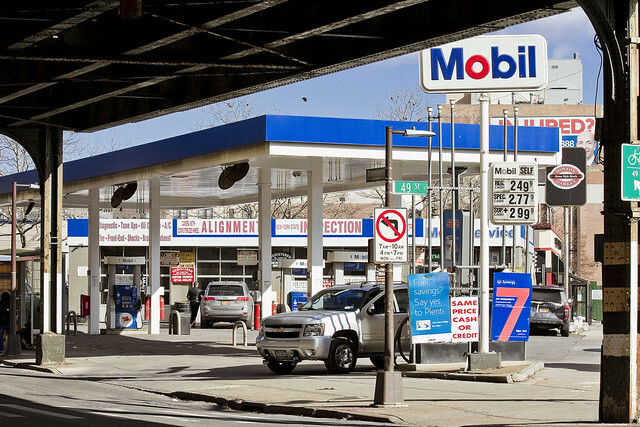 One has noticed over the last few years that filling stations with a small bodega have largely replaced the “gas pump and mechanic” style facilities. These latter versions, which host a larger number of pumping units than their forebears did, now seem to be disappearing as well. There’s a few left in the “central core” of NYC, but this non municipal infrastructure seems to be disappearing as well. Used to be… not too long ago… back when I was a boy… how sick one grows of using these phrases. Cab drivers have told me that they are often forced to travel long distances to fill their tanks these days. Forget about “normal” vehicles, of course. What are we going to do when all that’s left in NYC are apartment buildings? Pictured above is a gas station on Northern Blvd. at Steinway/39th Street, where one can witness – around 3:30 in the afternoon, an armada of taxi cabs filling up before the shift and driver change at 4 p.m. 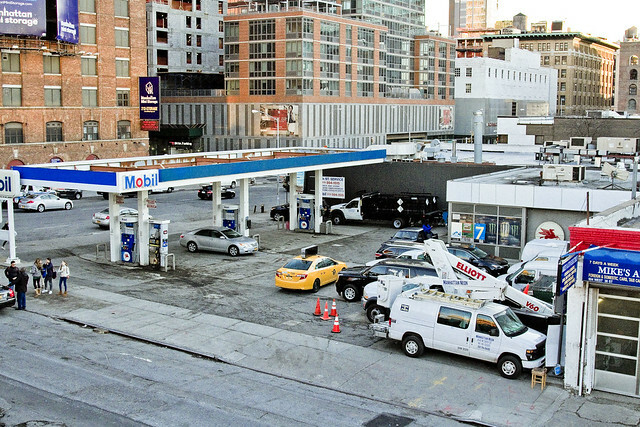 Here in the Astoria and Sunnsyide sections of LIC, there’s still a few gas stations left, but this one – so close to what would be the development site described in the Sunnyside Yards decking proposal – would clearly be wiped away. 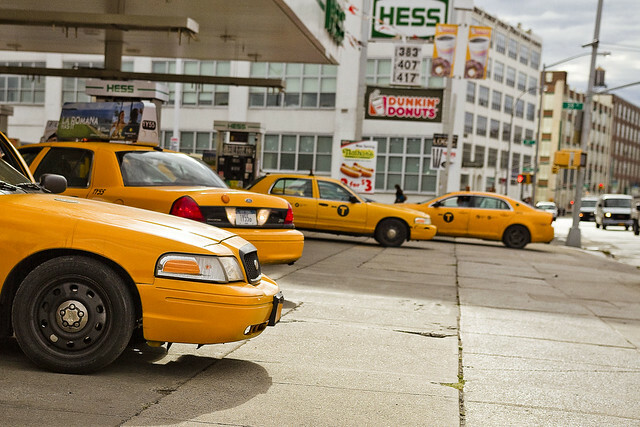 Part of the reason that the yellow cabs fill up in Queens is that there are so few gas stations left in Manhattan. The taxi industry used to be based along Manhattan’s west side, until a real estate craze there in the 1970’s and 80’s pushed them out. They relocated to LIC, largely, where the same process that pushed them out of Manhattan is now playing out. That’s one of the few survivors in Manhattan, below 96th street, pictured above. It’s at the northern edge of Hells Kitchen, adjoining the Hudson Yards development site.